Roger and Fay Oates have been designing and hand producing their uniquely smart, simple and classic pure wool Venetian Flatweave rugs and runners for over twenty years. When Roger and Fay first discovered a nineteenth century flatweave fragment in the late 1980s, they set out to reintroduce and reinvent this flooring, woven in such a way as to be utterly authentic and true to the art of weaving, yet completely grounded in chic twenty-first century taste. Designs are originated and coloured by both Fay and Roger and the production process is run by craftsmen who finish by hand. 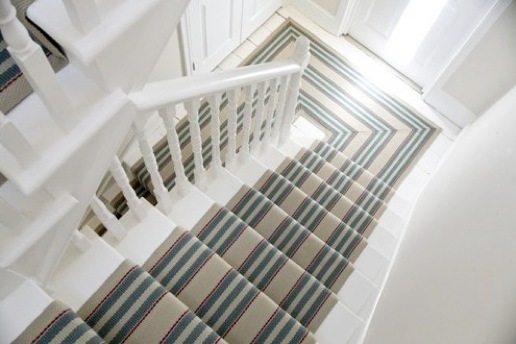 Roger and Fay's combined eye for colour mixed with practicality and their own standards of excellence, has taken a historic flatweave from being a relatively humble floor covering to being considered today's must-have design staple for floors and stairs in this country and across Europe, Scandinavia, North America and Australia. Roger and Fay Oates work from their studio complex in Herefordshire and have a Chelsea showroom at 1 Munro Terrace, Riley Street, London SW10 0DL.